Make every stroke count, or else into the draw with you! Poets The Fifth Annual Pat Schneider Poetry Contest, sponsored by the Amherst Writers & Artists, is currently accepting submissions. First prize is $1000 and receives publication in Peregrine Journal. Learn more. Call for Artists Miranda’s Hearth is seeking presenters for the #WhatIMake Conference on October 17, 2015 at Groundworks in New Bedford, MA. They are looking for makers in the broadest sense including, but not limited to, those who practice programming, robotics, gardening, cartooning, art, physics, cooking, biology, mapping, canning, writing, web design, framing, counseling, and music. Since presenters will lead a hands-on workshop in the afternoon, they are especially seeking speakers who are skilled at teaching. Selected presenters will be awarded a $50 honorarium plus up to $30 to cover supplies for workshops. They will also be asked to participate in at least two practice sessions before the event. To apply, submit the following to mirandashearth@gmail.com :a paragraph describing the subject of your talk; a paragraph describing the structure of your workshop, including your past teaching experiences; short bio and a resume. Call for Art Entries are now being accepted to Uforge Gallery’s Juror’s Choice Award exhibition. The juror is Judy Blotnick (’04 Painting Finalist). Will accept works in any subject and media, including ready-to-hang 2-D pieces within 36×48 in. and freestanding 3-D pieces within 24x24x24 in. Photographers Emerging and established photographers who live or work in New England are invited to submit work to the New England Photography Biennial, Danforth Art’s highly-selective exhibition of innovative, contemporary photography. Learn more. Studios event in October 2015. Learn more. Exhibition Proposals The Fort Point Arts Community (FPAC) Gallery in Boston seeks proposals in all media for five two-person or group shows for their 2015/2016 season. Artists selected to exhibit video/film work must provide their own equipment. Learn more. Call to Artists The artist-run Bromfield Gallery in Boston is seeking emerging and established New England artists to become members. Free application process. They plan to accept up to 5 artists this fall. With an emphasis on New England artists, its three gallery spaces exhibit contemporary art in all media, including printmaking, sculpture, painting, and drawing, as well as video, installation, and new media. To apply, send a link to your website to info@bromfieldgallery.com with this subject line: “Your Name: Membership Submission to Bromfield Gallery for September 1 deadline.” Finalists will be asked to bring 3-5 pieces from one recent body of work to a monthly meeting. Members receive a solo show every two years, in addition to showing work regularly in Gallery III and in their flat files, and being represented on their website. Their exhibitions are reviewed in Art New England and Artscope, among other publications. Monthly dues are $60 for Associate Members and $100 for Members. Duties include sitting or helping with a reception once a month, assisting with general gallery operations, and serving on ad hoc committees as needed. Bromfield staff includes a Manager, Bookkeeper and Installer. Learn more. Questions, contact Gary Duehr, Manager, at info@bromfieldgallery.com. Crafts Artists Artists Entries are now being accepted for the exhibition Materials: Hard & Soft, February 5 – April 1, 2016 at the Patterson-Appleton Center for the Visual Arts in Denton, Texas. The juror is Elizabeth Kozlowski, Curator of the Houston Center for Contemporary Craft. Learn more. Musicians Scholarships are available for musicians to attend the Future of Music Policy Summit to be held in Washington, D.C. Learn more. 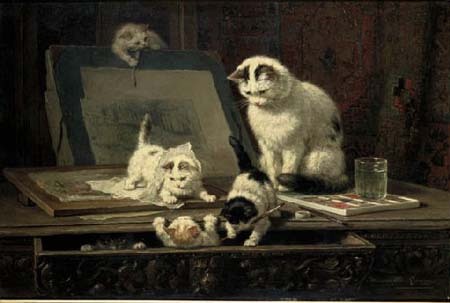 Image credit: The Painting Lesson by Henriette Ronner-Knip.